I took this shot back in November of 2008 while hiking along French Pete Creek in the Oregon Cascades. The leaves had mostly changed color and dropped already so the bright colors of the season were gone already. But there were a few leaves still around and this one that had magically landed on this rock protruding out of the middle of the stream caught my eye. What I like about this image is the almost zen-like state to it. 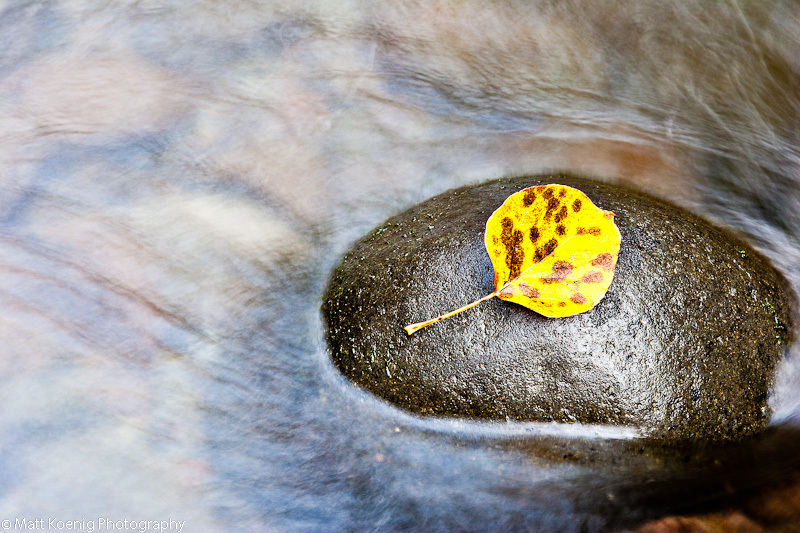 The smooth quality of the water as it parts around the cold hardness of the rock and the start bright yellow color of the leaf really create a relaxing image. One of the tools that I always carry with me when shooting water is a circular polarizer. I’ve learned their value the hard way early on after having so many shots come out with intense and distracting glare on the water. Think about the polarized glasses that people use when fishing so that they can see “into” the water. The circular polarizer works the same way, cutting or filtering polarized light perpendicular to the axis of the filter. It’s used to reduce reflections, it can saturate colors more and it can darken the sky. The filter basically has a ring on it that you can turn to orient the axis of the filter to control the pattern of light. It’s a great tool and fun to play around with. Great photograph Matt! It’s worth at least 1000 words and is definitely a work of art. I well remember that trip and your capturing quite a few excellent photo’s creekside as we hiked up into the Three Sisters Wilderness. To me this picture speaks”refuge”. The rock, rising from the swirling water, looks not unlike a buddist priest’s shaved head…it has a skull like quality to it….and the leaf represents a life’s journey towards death, here momentarily, the journey suspended in monk-like meditation, a refuge from the chaos of the life stream whirling all about. May you often find comfort and “grounding” on your rock of introspection. I believe in seeking refuge…as often as possible. For me it produces an enhanced clarity to life and I find it to be a good antidote to the stress of swirling waters. Keep up that excellent camera work! And remember the folk wisdom which says: “Never test the depth of water with both feet”. Hi Michelle! Sometimes the simplest things make good photos. I’m always on the look for subjects that are easily overlooked. It’s like a photo hunt. Maybe there should be a book on the Art of Zen Photography. Thanks for your comment!